"How to Trap a Devil!" In the years just prior to the Crisis on Infinite Earths, certain books popped up. Certain... Marvel-esque books. Books that you needed to read in succession to follow the story. 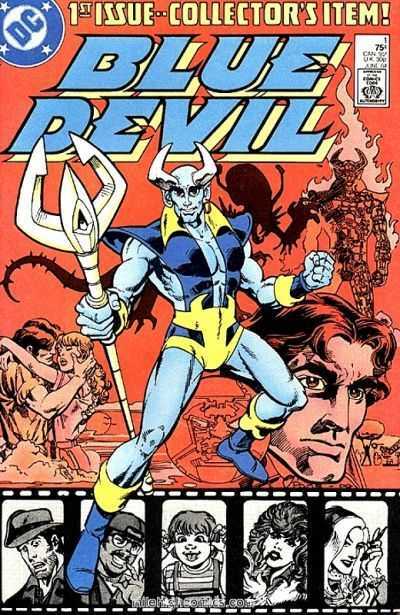 Books like Fury of Firestorm, and the book I want to discuss today, Blue Devil. Books such as these, in my opinion, epitomized "The New DC! There's No Stopping Us Now", and have to me been a really good "gateway drug" to the pre-Crisis DC Universe. We open on the Devil's Isle outside the Ruins of Ile de Diable. Several explorers stand prime and ready to ensnare the terrible Blue Devil in their special netting. This netting proves ineffective against the demon as he breaks his bonds an--CUT! Turns out this was simply a scene being shot for an upcoming motion picture. Here we meet Producer/Director Marla Bloom, Gopher and Blue Devil himself, Daniel Cassidy. It is explained that Dan's special Blue Devil suit affords the wearer super strength and capacity for special pyrotechnic effects. Dan offers up a brief strength exhibition, lifting a large boulder over his head. Marla mentions that someone named Sharon had gone off with another person named Wayne. This appears to bother Cassidy, and he retires to his trailer. It's revealed that Dan is carrying a torch for this Sharon, and considers Wayne (Tarrant) to be kind of a jerk. We now join Sharon and Wayne who are exploring some nearby ruins which are set to be a future filming location. Inside, Sharon discovers a golden mask-shaped item that appears to fit into an indentation on an interior wall. As the two press the piece into the wall, an otherworldy door begins to open. Out from the misty portal steps Nebiros, a demon that had been imprisoned for over six-thousand years. The shocked couple books it out of the ruins. Back on set, the crew appears to be relaxing between scenes. Sharon and Wayne burst onto the scene, Nebiros hot on their tail! The Demon cuts his way through the crowd, throwing bodies every which way. Wayne shows his true colors, acting cowardly and blaming Sharon for unleashing this beast. Sharon, however, bee-lines it to Cassidy's trailer. Dan dons his Blue Devil mask, and heads out to size up the situation. Marla takes note, and orders him into battle. Cassidy reminds her that many of his suits superpowers are basically special effects... glorified fireworks, even. Marla proves to be rather convincing and Dan relents. Bloom orders the crew to "keep those cameras rolling" and Blue Devil enters the fracas. Nebiros is initially rather amused by this "little demon's" offensive assault. The two trade blows and Dan finally gets the opportunity to toss a nearby boulder at the monster... which, only seems to tick the beast off. The battle becomes far more heated. Dan blasts Nebiros with his staff's flamethrower gimmick, who returns the favor with an energy blast from it's eyes. Dan Cassidy presumably lifeless body slumps to the ground as the film crew looks on. Cameraman, Norm hops in the crew's bulldozer and plows directly into Nebiros... which the demon easily shrugs off. It turns, and snags Miss Sharon, thinking she would make a fine meal... a feast, even! Blue Devil stirs back to life. Seeing the danger Sharon was now in makes him anxiously but purposefully reenter the fray. He manages to get Nebiros to release Sharon, who runs off to safety by Marla and a dejected Wayne. Blue Devil and Nebiros continue their struggle. Wayne, not wanting to view himself as a wimp any longer decides to perhaps enter the fray himself. He makes a lasso out of an electrical cable, and ropes the beast by it's neck. Nebiros shakes Wayne and company off their perch, which buys Blue Devil a brief moment in which he can get in a few shots. The crew advises that they'd reopened the portal at the ruins and Blue Devil directs the battle toward it. Dan is ultimately successful pressing Nebiros back through the doorway. The entire crew celebrates and Dan once more retires to his trailer. There's an ad in this book... for this book that bears the line "We've made comics fun again!". That pretty much sums it up. This was an incredibly fun comic book, and I immediately want to throw myself into the next issue. The writing is wonderful, and many of the characters have already been at least preliminarily fleshed out. The dialogue was great too, for the most part... I suppose I could have done without Nebiros' extraordinary verbosity. The art is also fantastic. Between the characters and the scenery, there is just so much here to love. Most definitely recommended. It doesn't appear to have ever been collected or made available digitally, so this is a single-issue endeavor. Seek it out... I promise you, it's worth the effort! I used to love this book as a kid. Paris Cullins left after a handful of issues, and the book never really found a suitable replacement, so it kind of foundered around, but it was a fun ride while they were firing on all cylinders. This was supposed to be collected (Soon?) in one of DC's black-and-white SHOWCASE phone-books, but I haven't heard about it in a while, so it may have been canceled. I remember kinda digging it when Alan Kupperberg took over art chores toward the end. It was more cartoony, but I dug the way he drew faces. I could have sworn I heard there was gonna be a SHOWCASE as well! This series definitely warrants one. I just couldn't believe there was no trace of this one digitally... I'd have figured they'd at least throw us a bone! Here's one that could use a four-color trade collection! Actually a bit to heady for me when it came out, but I went back to it in my twenties and absolutely loved it. And I've always wanted to see a Blue Devil/Booster Gold team up, even for a few issues. Blue Devil and Booster Gold would gave been a great time. Those very tail-end of the Pre-Crisis era characters were just so much fun. Throw in Firestorm and we've got a party! I'm not sure if this is the issue in this particular case, but I remember there being concerns with reprinting DC books from the late '80's-early '90's because of royalty issues.....DC kept soliciting SUICIDE SQUAD collections a few years back, then canceling them, because of this royalty problem. They only recently bit the bullet on those collections, probably because the upcoming film would make sales high enough to warrant the royalty payoff. Just a possible reason. I'd also heard about the rights issue. I was actively "holding my breath" for that Suicide Squad SHOWCASE Presents! When it was clear it was never gonna come, I had to do some crazy long-drivin' bin-trawlin' to complete my set!